As you know, the rosary is a well known devotion. The symbolic string of beads and carefully spoken prayers invoke a state of peace and meditation. Similarly, Rosary Gardens create a peaceful environment ideal for meditation or quiet reflection. They are also designed to honor Mary, the Blessed Mother of Jesus. Every element of a Rosary Garden comes together to make a spiritual retreat for parishioners. Stepping stones take the place of beads, five large stones and 50 small stones that together makeup the Decades of Christ's birth, life and death. Just as the medallion with Mary's likeness is the central part of the rosary, the statue of Mary in the center, the heart, of the Rosary Garden. The flowers used in a Rosary Garden are the visual symbols of the Mysteries: Luminous (purple), Glorious (yellow/gold), Sorrowful (red) and Joyful (white). Chosen by color, as well as shape and size, the floral representation of the Mysteries also help create a serene atmosphere in the garden. These elements must be present to create a Rosary Garden, large or small. In fact, building a Rosary Garden is a task that anyone can complete. any form can be used. This includes the Madonna and Child, Our Lady of Lourdes, Our Lady of Guadalupe and Our Lady of Grace images. The statue must be large. It is not just the center of the garden, it's the heart. Traditional Rosary Gardens have stones representing the five decades of the life of Christ--from birth to death and resurrection. For this, all you need is five large square stepping-stones and 50 round ones. As the stones are walked, the rosary prayer is said in remembrance. Visitors will actually walk on these stones as they pray, so make sure that they are sturdy. Another important piece is the Crucifix near the entrance to the garden. It need not be large, to distract from the Mary statue, but large enough to signify the entrance to the garden. The flowers in the Rosary garden symbolize the four sets of Mysteries surrounding Christ's life. So, select four plants of appropriate color. As the visitor walks the stones, praying the rosary , the sight of the flowers will facilitate the meditation. Make sure you buy enough plants of each color to fill the garden and seek help from a landscaping professional if needed. Begin building the Rosary Garden by clearing the area. A clean slate is needed because every element is symbolic and cooperates with others to induce meditation and reflection. Place the statue in the center of the space. Then, place the stepping-stones in a wide circle around the statue. There should be five small stones between each of the four larger ones, all positioned in the circle formation. Finally, plant the flowers. 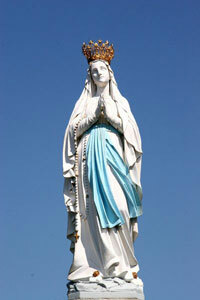 They must be placed in relation to the statue, making sure that the statue of Mary remains the heart of the garden. In addition, plant flowers so that walking space remains around the stones. If desired, you can finish the Rosary Garden with a bench placed inside the garden, but near the flower border. This will allow some visitors to sit while others walk. You can also place small markers near the flowers that explain what they are and how they relate to the devotion. Larger gardens position brochure holders neatly near the entrance for visitors. These handouts serve the same purpose as the marker. Although the idea of a Rosary Garden was created with the Catholic faith in mind, it is not an exclusive concept. The Rosary Garden's elements are easily adaptable to the Christian faith, which also values peace, meditation, prayer and reflection. In the end, your Rosary Garden will serve not only your church or home, but the surrounding community as well.